Unfortunately I don't know much about this cinema. I think it was built in the 1950s and it was closed in the early 1990s. In the same building there was a public library - one of the rare postcards with a library. I'm still wondering about the name of the cinema: Winterstein (in English "Winter Stone"). It could be a place name. And then it could be from the actor Eduard von Winterstein (1871-1961). But he is more famous as a theatre actor than a movie actor. And he was still alive, when the cinema was opened. It wasn't usual to name a building after a living person. 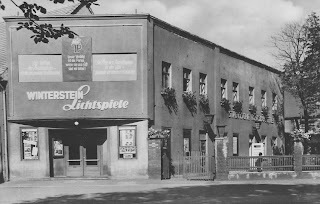 The sign above the name was the logo of Junge Pioniere, the East German youth organisation of schoolchildren aged 6 to 14. Under the logo is written: "Unser Vorbild ist die Partei. Wenn sie uns ruft, sind wir bereit! - The party is our ideal. We are ready, when it calls."